When you start your first Web site, it's natural to put all your HTML files in one folder, the one where your ISP told you to put them. But as you keep adding new pages, that setup becomes unwieldy. Every user who creates any significant number of files on his computer eventually faces this dilemma. Most compromise by creating a directory hierarchy of some sort (rather than trying to keep all of their files in one place) but keeping the total number of directories as limited as possible. In most cases, it's best to have a lot of levels to the hierarchy but few directories in each level, with, at every level, a very distinct difference between the functions and names of the directories. Down at the bottom of the hierarchy, you can have a large number of directories because it should be easy to navigate your way down the branches of the hierarchy and end up in the right place, where the group of related files you want is located. For example, on my computer, on the C: drive, I have two directories, fiction and nonfiction. nonfiction is the top of a branch of the tree where all the boring stuff goes - financial info, and so on. fiction is the fun part of my computer. That's divided into the directories novels and stories. Each short story is a single Microsoft Word file inside the stories directory. Under novels, there's a separate directory for each novel. The contents of those directories depends on the nature of each novel. Because the nonfiction side of life is so much messier than the fictional side, the nonfiction directory is the top point in a messier organization, with more levels and more directories per level than the fiction side of the computer. Some day, perhaps I'll reorganize the nonfiction area to be more sensible and navigable. Sure. Right after I clean out the garage. Unfortunately, none of this has anything to do with Web sites. Actually, it does. But the rules (guidelines) are different. In fact, it's probably much messier than that. Your site probably has, or soon will have, many more pages than the one in the diagram. Also, there'll be many more links than the ones represented by the arrows. If those were the only links, there'd be pages in the site shown that you could get to but couldn't get out of without using the browser's back arrow, and a lot of users are annoyed when they find themselves trapped that way. Moreover, if someone gets to such a page because of a Google search, his browser's back arrow will take him back to Google, not to another page in your site. (See the section titled Navigation for more on all of this.) In practice, every page has, or should have, a set of links to various other pages, and those aren't shown in the picture. As I keep saying, you don't want the user to be confused. So you should fit your site into some kind of conceptual hierarchy - that is, a general picture of how the topics or content areas are arranged and relate to each other and are subordinate to each other. This is how you want visitors to think of the structure of your site. The main page is divided into four main areas - David, Leonore, Recently Added, and, inevitably, Miscellaneous. 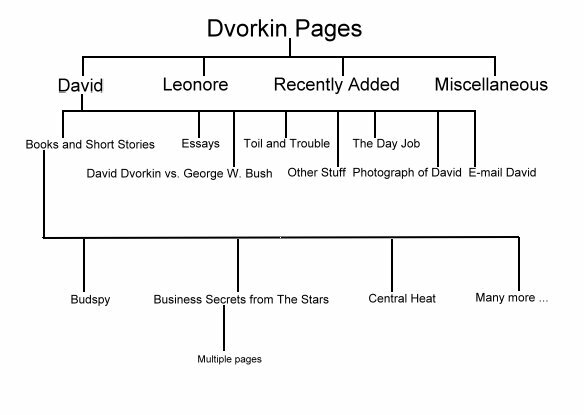 The David section is then subdivided into Books and Short Stories, Essays, Toil and Trouble, The Day Job, David Dvorkin vs. George W. Bush, Other Stuff, Photograph of David, and E-mail David. And it's unrelated to the actual physical hierarchy - i.e., the way I chose to store files for my own convenience. Which is pretty awful. It's okay when a user gets to such a page via a link, since in that case he doesn't notice the details of the URL. But if you expect a user to type that monster into a browser, or even just to remember it - well, no one would. They'll click on that, their browsers will only pick up the first line, and they'll get an error message. 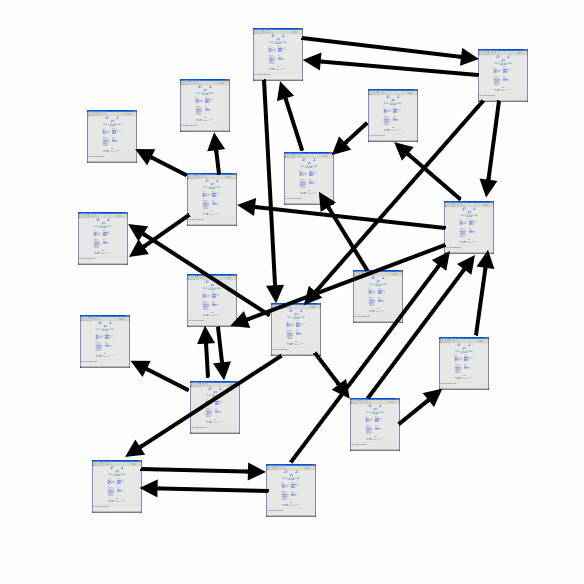 This illustrates how the physical and conceptual hierarchies differ. It also illustrates the importance of choosing short names for the directories on your site and for having a physical hierarchy that doesn't go down too many levels. The potential problem with this approach is that the more / symbols you have in the URL, and the more cryptic the directory names are, the likelier it is that someone will mistype the URL. Ideally, the books you're publicizing on your Web site have been published and are available for sale. That's not a requirement. After all, it's your Web site, and you can put anything you want to on it. You could be using your site as a showcase for your work, in hopes of attracting attention which will eventually lead to publication and fame and fortune. If that's the case, ignore the stuff below about putting excerpts of the books on your site. There's an ongoing debate in the writing community about whether by doing so you have forfeited your right to sell the book to a publisher under the normal conditions (First North American Serial Rights, for those of us in the U.S.). Publishers like to publish original work that hasn't been published before, but if you publish your work on your Web site, it has been, well, published. On the other hand, here's a dissenting voice from an actual lawyer guy. Whichever side you choose to agree with, there's no good reason to put excerpts of unpublished works on the Web. Disabuse yourself of the notion that agents and editors are scouring the Web, looking for good writers they can represent or good writing they can publish. Reputable agents, that is, or editors for reputable publishers. The reputable ones are swamped with submissions and pleading letters from aspiring writers and don't have the time or the need to actively go out and look for more. If editors and agents aren't looking at personal Web sites in search of people to represent or publish, then, if you're not already published, what's the point of going through all of the trouble I'm describing in these pages? Honestly, I'm not sure there is much point in it. If you're still an aspiring author, then a good Web site might attract followers or fans who will eagerly buy your books once they're available. But I'd advise against counting on that. You're more likely to attract people who will say earnestly that they're certainly going to buy your books as soon as they get published, but who will turn into smoke and vanish in the breeze once your books actually are available. Each book should have its own directory. Do it that way from the start. You'll thank me later. One of those stupid mistakes was that I created a single page listing all of the books I had published up to that point, in chronological order, with a brief description of each one. Periodically, I went back to that page and added more information about the individual books, and I also added more books as I published more. Of course, the page became far too long and unwieldy. Also ugly. And not very useful to the legions of fans I hoped were looking for information about me. So I made a second, albeit not quite so stupid, mistake. I divided that page up into many pages - one for an overview or introduction, and one for each book. Then I kept adding text to those pages. Soon I wanted to add an image of each book's cover, and then excerpts from the books. So finally I created a directory for each book. (Well, that's the plan. Some of them haven't yet been created. Like every other Web site, this one is a work in progress.) That way, I can have the various graphics files for that book in that folder, along with everything else associated just with that book. If you want to be a bit more sophisticated, you can follow fairly standard Web development practice and create a directory called images inside the directory for a book, and then put the cover images and any other graphics in there. Because images are only referenced via the <img> tag from within your HTML files, visitors won't be aware of the extra layer of directory and won't be bothered by it. You don't have to wait for a book to be published to set up a directory for it. You can do a lot of the work ahead of time. You can set up the directory without any links to it, so that when the time comes, you'll have a head start. If you're afraid that the files in the directory will be picked up by Google and other search engines, and people will see pages you're not ready for them to see, you can use the robots.txt file to tell the search engines to ignore those pages. Click here for a good tutorial on the subject. without bothering about tacking on an HTML page at the end. The user's browser will automatically show the index.html page in the mynewbook directory. This applies to all directories on your site, of course, not just the ones for books. There are exceptions to this rule about the index.html page. Some ISPs have their servers set to look for a different default page - home.html, for example. You should check to make sure. Creating a directory for a new or forthcoming book is good self-discipline. It helps keep you from lazily creating a single page for the book in the root directory and telling yourself that you'll take care of the new-directory chore later on. If you do take the lazy route, though, and then later you set up a directory to replace the single file for a book, be sure not to delete that single file. You've just created some extra, but very necessary, work for yourself. See Dead Files (Forwarding the Browser) for an explanation. I mentioned thumbnails above. That refers to a small version of a graphic, usually about the size of a postage stamp. Thumbnails are commonly used to give an idea of what the full-sized graphic looks like, and to link to them. You should never include the large or full-sized image of your book's cover in the book's index.html page. If you do, you'll be creating an HTML page that can take a long time to download for users with slow connections. You'll also create a page that requires a lot of scrolling up and down. It's far better to use a thumbnail of the cover and make the thumbnail a link to another page in which you have the large cover. (Again, for an example of what I mean, click the Business Secrets from the Stars link at the top or bottom of this page, and then click on the small image - the thumbnail - of the cover.) Of course, you hope that any visitor will want to look at the full-sized cover image in all its beauty, but even if he doesn't, he can still look at the overview page about the book and read all the important stuff, without having to scroll past a large graphic. Clearly, if there's more than one cover associated with the book, perhaps because of different editions or foreign editions, then the argument for thumbnails instead of full-sized graphics on the index.html page becomes even stronger. Another advantage of having a separate HTML page devoted to a single large cover image is that you can add interesting information about the cover. You can talk about the cover artist and add a link to his professional site, if he has one. For one thing, readers find that kind of information interesting. For another, it's only right to give the artist credit where it's due. You'll also earn his gratitude and possibly a link back to your site, perhaps from a site that gets much more traffic than yours does now. Also, you've ensured that that page on your site will show up in Google if someone searches for that cover artist. Because someone may find the HTML page devoted to the book's cover via a Google search on the artist, you should be sure to have a prominent link on that page pointing back to the directory's index.html page. You don't want someone to surf to the cover page by chance, think it's interesting, but then have no idea what it's all about. You want him to follow his interest back to the main page about the book. If he then finds that page interesting enough, or reads the excerpts and likes them, you may have made a sale. You should have some, and there's not much more to say about it than that. Choose five or ten or 20 pages from your book. It doesn't have to be from the beginning of the book. Try to choose an excerpt that gives the flavor of the story and the writing and that will leave a reader yearning for more. You can show the excerpt in the form of an HTML page linked from the book's index.html page. You can also provide the excerpt as a PDF file, also linked from the book's index.html page. Do local bookstores who carry your book a favor by listing them, along with their addresses and other contact information, on the book's index.html page. If they have Web sites of their own, link to those.